The 2018 CMP competition rules are now approved and posted on the CMP website. 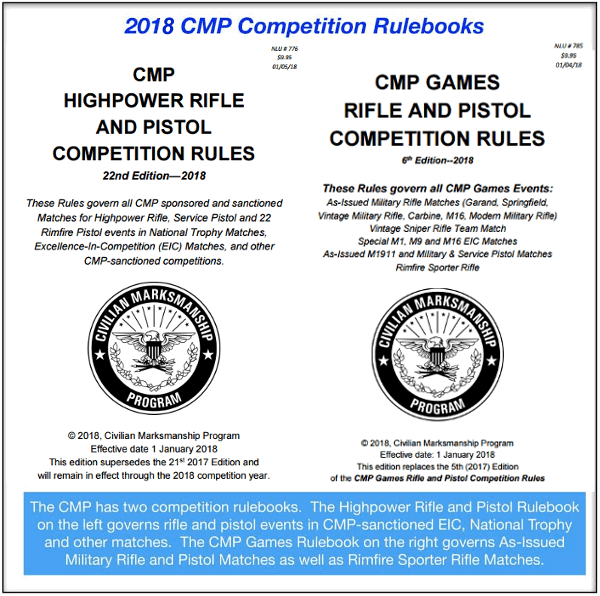 The 2018 CMP Highpower Rifle and Pistol Competition Rules and the 2018 CMP Games Rifle and Pistol Competition Rules can be downloaded on the CMP Competition Rules Page. There are a number of important CMP Rule changes for 2018 that are spelled out below. CMP Competition Rules have undergone major changes in the last few years that were aimed at modernizing the CMP competition program and promoting greater participation in rifle and pistol target shooting. In 2015, rule changes expanded the types of pistols that can be used in EIC and National Match Service Pistol events and introduced the immediately popular CMP 22 Rimfire Pistol Distinguished program. The most significant 2016 change was the authorization for Service Rifle shooters to use optical sights with 4.5X max magnification. 2017 saw the introduction of a new classification system, rules for electronic targets and the addition of rules for “Alternative Rifles” and “Match Rifles”. The biggest change in the 2018 Rules is the introduction of a two-track system for conducting CMP-sanctioned Highpower Rifle Matches. Highpower Rifle events can now be conducted as either traditional “National Trophy Rifle Events” where there are no sighting shots and competitors start rapid-fire series from standing or as “CMP Cup Match Events” where sighting shots are allowed before each stage and competitors start rapid-fire series in position. All EIC Rifle Matches and Camp Perry National Trophy Matches will continue to be conducted according to National Trophy rules, with no sighters and rapid-fire starting from standing. The CMP Cup Matches, which are scheduled at the beginning of the 2018 CMP Highpower Rifle Matches at Camp Perry on 23-25 July, and the CMP Cup Matches, which are included in the 2018 CMP Travel Games programs, will be conducted under Cup Match rules with sighters and rapid-fire stages starting in position. The rules for CMP As-Issued Military Rifle and Pistol events and Rimfire Sporter Matches remain unchanged in this regard. These events typically allow sighters at the beginning of each course of fire. Competitors start rapid-fire series from standing, but any competitors who are 70 or over or who have physical limitations that prevent them from readily standing and getting back into position are allowed to start rapid-fire series in position. Otherwise the 2018 CMP Games Rifle and Pistol Rules, which include Rimfire Sporter Rifle Rules, have only minor changes from the 2017 edition. National Records — Rules providing for the official recognition of National Records in open and junior categories in CMP-recognized events were added for 2018. 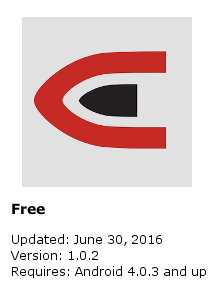 The CMP is compiling its first list of official records and will post it on the CMP website as soon as it is ready. To be recognized as National Records, scores must be fired in the National Matches or in competitions conducted by the CMP staff such as CMP Travel Games or National Range Matches. Traditional smallbore rifle championships are returning to Camp Perry in 2018 and rules for those events are being drafted now. The 2018 National Matches Calendar features six days of CMP Smallbore Rifle shooting on 17-22 July. There will be two days of smallbore position and four days of smallbore prone shooting, along with one full day of Rimfire Sporter Rifle competition on 22 July. Provisional CMP Smallbore Rifle Rules will be released in the next few weeks. Electronic Targets — A new section has been added to the CMP Rulebooks to help explain and clarify the CMP’s Electronic Scoring Target Rules. 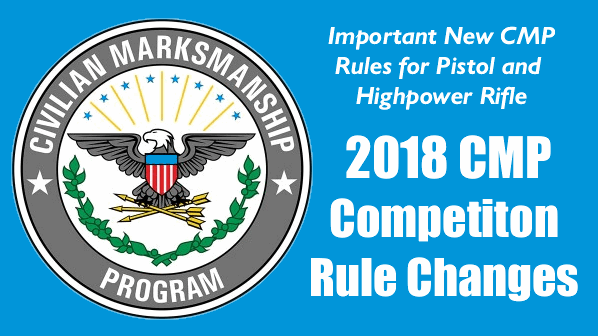 See Rule 7.0 in the CMP Competition Highpower Rifle and Pistol Competition Rules or Rule 9.0 in the CMP Games Rifle and Pistol Competition Rules. Share the post "CMP 2018 Competition Rules Issued — Some Notable Changes"
Tired of hauling around an old-fashioned Score Book and making entries with pencil and paper? 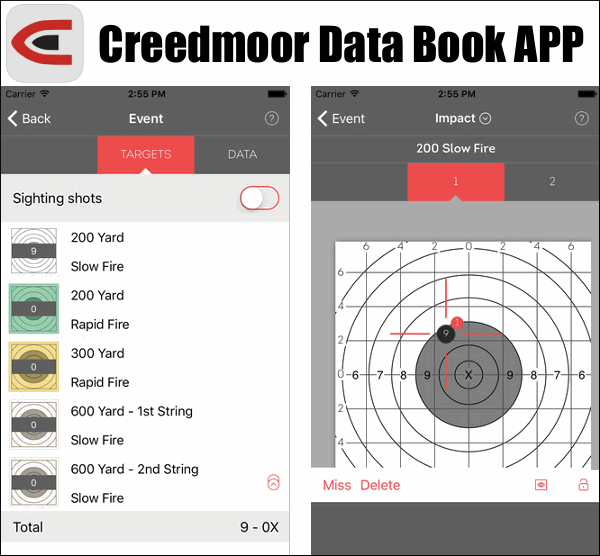 Well now you can go digital — Creedmoor Sports has released a full-featured Scoring Book App that lets you plot your shot locations using an iPhone, iPod, or iPad (Apple tablet). The price is right — just visit the iTunes store to download the App for FREE. 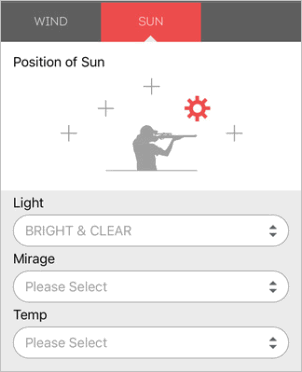 This new App, available for free in the Apple App Store, and the Google Play Store provides all the same functions and capabilities of the traditional Creedmoor print Data Book, but with the convenience and ease of recording your match and practice information with your iPhone or tablet. With this App you can break your 20 shot slow-fire segments into either 10- or 20-shot targets, and also opt for sighting shots. All the specific event data can also be recorded, such as location, wind, light etc., along with wind and elevation adjustments. COMMUNICATIONS Restrictions: In some matches you are not allowed to have electronic communication ability, so you may have to set your iPhone to “Airplane Mode”, or use this only with an iPod (which does not have two-way communication capability). Share the post "FREE Creedmoor Scoring Book App for iOS and Android"
Does your Black Rifle have a sloppy upper/lower fit? That can be annoying; what’s more, loose fit can limit accuracy potential. Here’s a clever solution for poor-fitting AR-15 and AR-10 upper and lower receivers. The new JP MicroFit takedown pins can improve even the sloppiest ARs, providing a rock-solid upper/lower receiver fit. MicroFit pins come in three sizes and two types: standard (“mean”), oversized, and undersized, with types for both front and rear of the receivers. The mean pins match standard takedown pin sizes while the over- and under-sized vary by slightly more than .001″ (+/-) from the standard diameter. NOTE: Although most poor-fitting receivers are loose, some are too tight. Very tight receivers, such as post-Cerakote, can be remedied with the undersized pins. Shown is JP Enterprises’ PSC-12™ upper assembly with LRP-07™ lower assembly. “An AR with a loose upper/lower receiver… will not reach its accuracy potential. That was the goal with our original JP Tension Pin, but MicroFit™ pins provide the same result without tool-assisted takedown. The MicroFit pins require no modification to the receiver. They simply replace your current pins”, stated JP Enterprises founder John Paul. 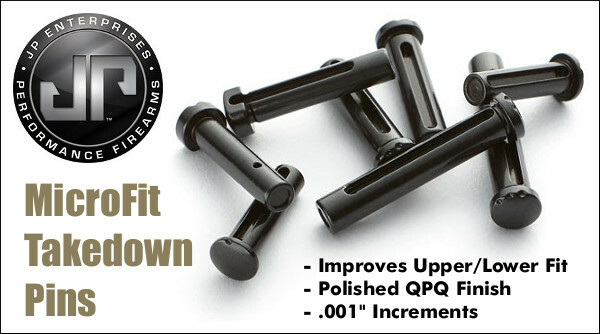 JP’s MicroFit pins feature a polished black finish with a hard, durable QPQ coating. This provides smooth insertion/removal plus excellent corrosion resistance. All pins feature a two-faceted punch or bullet capturing recess. This allows the user to apply force to the pins safely without risking scratching the receiver. JP’s MicroFit pins are sold as both as individual pins and as replacement sets. Share the post "JP MicroFit Takedown Pins for AR15s and AR10s"